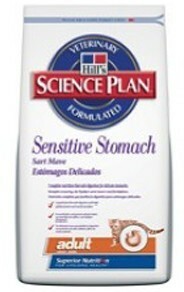 Science Plan* Feline Sensitive Stomach Adult with Egg & Rice is formulated to meet all the nutritional requirements of healthy cats from maturity until 7 years of age. It combines highly digestible ingredients with a blend of soluble and insoluble fibre and additional antioxidant vitamins to promote gastrointestinal health. Objective - To provide ingredients that can be readily digested and absorbed in combination with a blend of soluble and insoluble fibre, to help support normal gastrointestinal motility and function, and proven effective levels of biologically active antioxidants. Science Plan Feline Sensitive Stomach Adult with Egg & Rice also contains a Superior Antioxidant Formula to reduce oxidative cell damage. During pregnancy or lactation queens should be switched to Science Plan Feline Growth*.